I think the Environmental supporters of his cause are buying into a nasty mess … Read A.G Morice’s History of the Interior of Northern British Columbia again the other day and see that he uses the phrase since “time immemorial” twice in the book. In one of the appendix he says the Russians likely came ashore in North America in 1648 and Simon Fraser saw several items of Russian manufacture on his journey to the mouth of the Fraser in 1807. Morice also talks about there being no chiefs before trade with the North West Company and Hudson Bay Company there were several classes of society though with the nobles having hereditary titles and territories Page 5 “As to the Babines, the Carriers , and the Chilcotins, they possessed what they called Toeneza, hereditary noblemen who owned the hunting grounds and were the honorary heads of various clans. I attended an evening of guest speakers – “Voices from the sacrifice zone” – Canadian Association of Physicians for the Environment (CAPE). I was reminded of my teachings in university tonight. (I have a BA in Human Geography and minors in both First Nation Studies and Political Science) It was kind of cool to hear David Suzuki open the night. I have not been in the same room as him before (I always geeked out learning from his work as a child). On many geographic scales of local to global (well mostly Canada) we explored how corporations run this country. How oil and gas development is ridiculously unregulated. How medically life threatening the lives are for people at ground zero (especially north eastern B.C.) and how much we all need each other. We need research. We need medical geographers documenting the fall out of fracking, etc. We need climate action. We need better ways to generate our energy and resources. I videotaped my brother (my clan chief – look at that photo, he speaks alongside David Suzuki!) He spoke for 30 minutes on Indigenous issues, about our responsibilities and duties, about ethical leadership and good Indigenous Governance. I cried at the memories of how disgusting corporations are and disrespectful not only to our grief, loss, processes (recently)but also to the Indigenous women. Our women. And it’s appalling how the RCMP and government in power falls in line with corporations and not the people who voted them in. We don’t live in a democracy any more. We live in a state of crisis – climate change is forever changing the future of our lands and therefore the future of all living things. In spite of it all, we stand strong. We are educated. 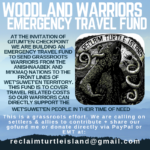 We are Wet’suwet’en, we are warriors. Our strength is awakened in this wonderful generation of movers, shakers, we rise above it all culturally grounded and reclaiming our inherent right to protect each other as humans and our most wonderful earth. Indigenous Resurgence is the air we breathe. I love it ❤️🌎 …I’m still hopeful! This entry was posted in Aboriginal Radicals, Bulkley Valley, Coastal GasLink, Letters to Editor and tagged Warner Naziel. Bookmark the permalink. We have conclusive evidence that both Warner Naziel and Adam Gagnon belong to the Owl House and have no rights to the lands they intend to occupy without free prior consent of the legitimate members of the Sun House. Even if they have a cousin who is a lawyer, all the more it becomes willful breach of the law.